LATHAM, NY, August 17, 2018 — Marquis Who's Who, the world's premier publisher of biographical profiles, is proud to present Walter Lee Robb, PhD, with the Albert Nelson Marquis Lifetime Achievement Award. An accomplished listee, Dr. Robb celebrates many years' experience in his professional network, and has been noted for achievements, leadership qualities, and the credentials and successes he has accrued in his field. As in all Marquis Who's Who biographical volumes, individuals profiled are selected on the basis of current reference value. Factors such as position, noteworthy accomplishments, visibility, and prominence in a field are all taken into account during the selection process. Dr. Robb has been the CEO of Meoh Power since 2014, having also established Vantage Management Inc. in Schenectady, N.Y. in 1993. Additionally, he has long served as the senior vice president and CTO of General Electric (GE) Company between 1986 and 1992 and as the director of the Schenectady, N.Y. based GE research and development center. Dr. Robb was first hired by the company in 1951 as a chemical engineer. He later moved into management roles, earning the titles of General Manager of both GE silicone products and the GE medical systems group. Known as the first engineer to head a corporate, central research laboratory, which were typically managed by chemists and physicists, Dr. Robb started a new trend in research laboratories who are now placing engineers in these positions. At GE, Dr. Robb developed patents in the field of membranes and gas separation and led the development of the first fan beam CT scanner, 1.5 Tesda MRI, digital ultrasound and digital radiocology. These products became the Gold Standard in medical imaging. Earlier in his career, he developed the first artificial lung, which he demonstrated via a hamster in a cage underwater in 1964. As a result, Dr. Robb and his story made the front cover of “Life” magazine. 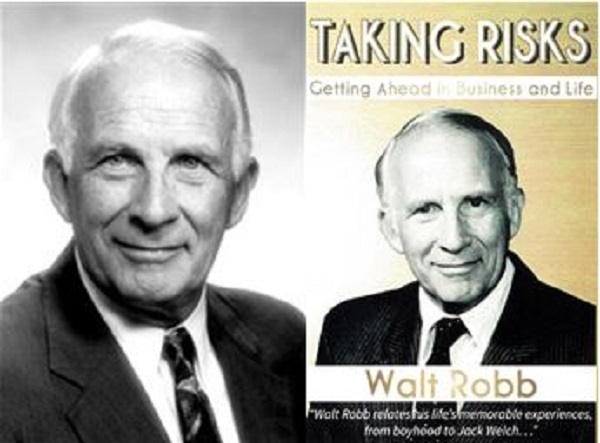 Dr. Robb authored “Taking Risks: Getting Ahead in Business and Life.” He is a longtime member of the NEA and the American Philosophical Society, formerly served on the board of directors of Mechanical Technology, Inc., and is currently serving on the board of trustees at Clarkson University, on the Proctor's theater board, and the board of the Double H Ranch for sick children. An investor of many local start-up companies, he is the former director of Celgene Corporation and Cree Inc. and the former owner of the Albany River Rats in the American Hockey League. The recipient of a 1993 National Medal of Technology and a 1994 Industrial Research Institute Medal, Dr. Robb has been showcased in approximately 40 editions of Who's Who, including Who's Who in America, Who's Who in Science and Engineering and Who's Who in the World. He earned an undergraduate degree from Pennsylvania State University in 1948, followed by a master's and PhD from the University of Illinois in 1950 and 1951 respectively, and has since received an Honorary DEng from the Milwaukee School of Engineering in 1994, and an Honorary Doctor of Science from Worchester Polytechnic Institute. In recognition of outstanding contributions to his profession and the Marquis Who's Who community, Walter Lee Robb, PhD, has been featured on the Albert Nelson Marquis Lifetime Achievement website. Please visit www.ltachievers.com for more information about this honor.